One of the common problems when having multiple Renko charts with different box sizes is that a trader could end up getting confused on the Box Size of the Renko chart they are looking at. There are not many indicators which seem to address this, which is where the Renko trade assistant indicator can be of great help. By adding this Renko trade assistant indicator to your offline Renko or Median Renko charts, it can instantly show you the Box size of the Renko chart as well as the key reversal points. 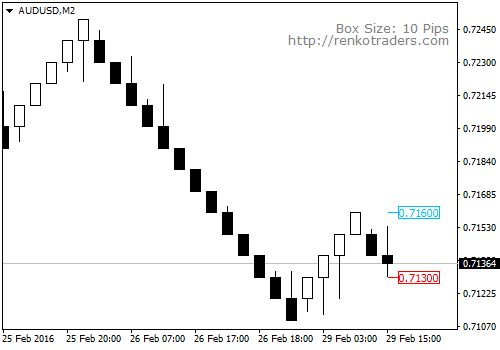 The Renko chart below shows a glimpse of what this handy Renko indicator can do for you. As you can notice, on the top right corner of the screen is the section which tells you what Renko box size chart you are looking at. On the price chart, you can see the price labels, which show the next reversal points on the chart. The following screenshot shows the indicator settings that can be configured. 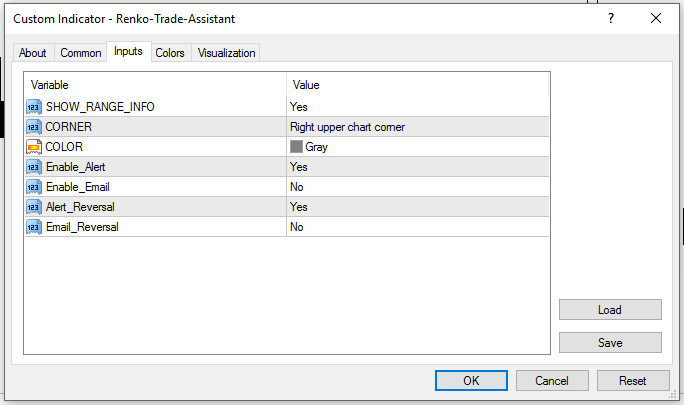 How can the Renko Trade Assistant Indicator help you? The Renko Trade Assistant indicator helps you especially if you have multiple Renko or Median Renko charts opens. It can get a bit confusing when navigating between the various Renko charts as you will have to look at the Open/Close prices of previous boxes to determine the box size that you are using. With the Renko Trade Assistant Indicator, a quick glance and the indicator will show you what Renko chart you are looking at. Take a look at the following screenshot where we have four different types of Renko charts with different box sizes and how they can be easily identified with the Renko Trade Assistant. The Renko Trade Assistant is compatible with the latest MT4 build 950 and the indicator will be updated on any future MT4 versions. Download the zipped file from below.